Grew Up... constantly moving around the world with her U.S. Army officer father and her late mother. Poussey’s name comes from the town in France where her father was stationed when she was born, and she speaks fluent German after spending her teen years in southern Germany. Living... in Litchfield Penitentiary, a minimum-security women’s federal prison in upstate New York, locked up for an unknown crime. She spends most of her time joking with her fellow black inmates. Profession... librarian in the prison library. She’s an avid reader and takes her role as the library’s protector and champion very seriously: she fights to save as many books as possible from floods and bedbugs, and even holds a memorial service for the favorite titles that she couldn’t save. Interests... of her beloved books, the Harry Potter series ranks highest. She is also a big fan of the cooking show Judy King at Home, so there better be nobody hogging the common room TV when Judy comes on. Relationship Status... single, but looking for love. She’s especially close to her best friend Taystee, a friendship that survives her confessing unrequited feelings for Taystee and prison bigwig Vee trying to get between them. She fights for the people she loves; even as a teenager she stood up to her German girlfriend’s father when he disapproved of their relationship. Challenge... dealing withthe trials and tribulations that come with surviving daily life in prison. She’s a girl with a lot of feelings, and prison is hard on someone who’s only looking to love and be loved. She brews her own hooch to help cope, but this only ends up adding alcoholism to her list of problems. Personality... loyal and caring, especially to her friends. She is a jokester and loves to have a good time, but she has a strong moral and code and will always fight for her beliefs. Poussey Washington's popularity ranking on CharacTour is #1141 out of 5,000+ characters. See our top-ranked characters and read their profiles. 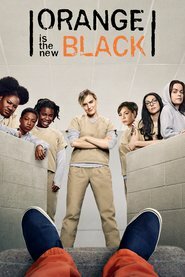 A crime she committed in her youthful past sends Piper Chapman to a women's prison, where she trades her comfortable New York life for one of unexpected camaraderie and conflict in an eccentric group of fellow inmates.